The answer to this question will depend on many different factors which we will try to go through in this post. The first factor is what level of poor credit you have. Are we talking defaults, CCJs, Bankruptcy, Debt Management plans or arrears? Once we know what poor credit problems we are trying to overcome we need to look at when these issues were registered on your credit report. Whilst the size and nature of the adverse credit records are important, so to is the age of adverse records on your credit report. These can be a big factor in determining what options are available. A smaller part of the process when looking at poor credit is what they bad credit entries were for? A prime example of this being a mobile phone contract default that is on your credit report. Most lenders whom review the credit report (rather than auto score) may be more inclined to treat a mobile phone contract default less severely than a credit card default. Some Mortgage lenders will treat all defaults the same. Whilst it is only a smaller part of the process, it can mean a big difference in the rates and it is also one of the reasons why we say “the devil is in the detail”. Two defaults registered on the same day for the same amount can be treated very differently depending on the type of account subject to the default. Lastly who the money (subject to the poor credit mention) was owed to, which I will touch on more later in this article. As Mortgage Brokers who specialise in poor credit mortgages, our job is to go through your credit reports and navigate you through what can be a minefield to find the lenders who fit your circumstances. Once we have an idea of the adverse credit we are up against we can then compare that to the lenders criteria. The mortgage lenders criteria can vary depending on the Loan to Valuation (LTV). The larger the deposit, the more relaxed the criteria usually is and the easier it can be to pass the credit scoring process, if there is one. There is a post here about the difference between credit scoring and credit checking that may be of interest. This can be a double edged sword. On the one hand you have a history with your bank and they know you far better than a new lender will. They will be able to see much further back than 3 months, which is usually how many months statements a mortgage lender will ask for. They may even have an internal customer score for you which can help when going through the initial credit check for a Mortgage application. On the other hand, your bank can see much further back than 3 months. If you have had any issues, bounced Direct debits, going over your overdraft, a lot of gambling transactions, pay day loans or adverse credit, particularly with your bank in the past, they will have a lot more information to potentially hold against you when making their decision on your Mortgage application. The other issue is that most banks will credit score your application. If you have a lot of adverse credit or recent poor credit issues, it probably does not matter how good your relationship with your bank is as it is quite likely you would still fail their scoring system. If not my bank, then who? This will depend on many different factors. For all but the most extreme cases there is likely one or more lenders with the appetite to lend to someone in your circumstances. Whether your credit issues were with the those lenders and if so, the same principle applies in that how much the adverse was for and how recent may determine how forgiving they are. A prime example is one high street lender who will keep an internal record for far longer than 6 years. If they have ever had to write off any debt in your name – even as little as a penny, they will not lend to you until it has been satisfied for at least 12 months. Mortgage Success is a Whole of Market Mortgage Brokers and has access to over 70 different Mortgage lenders at the last count. Some of those mortgage lenders are well known high street banks, some are smaller banks who do not have a high street presence, others are building societies and some are private lending groups. All of them are fully regulated in the UK by the Financial Conduct Authority (FCA) and work to strict guidelines set out by the governing body. Although you may not have heard of all of the lenders we have access to, they are all reputable lenders – even those who work in the more specialist part of the market for those of you with poor credit. 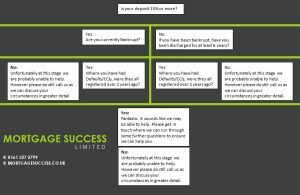 When we first speak to a potential customer we ask a few questions to get a basic understanding of your circumstances and what it is you are hoping to achieve. 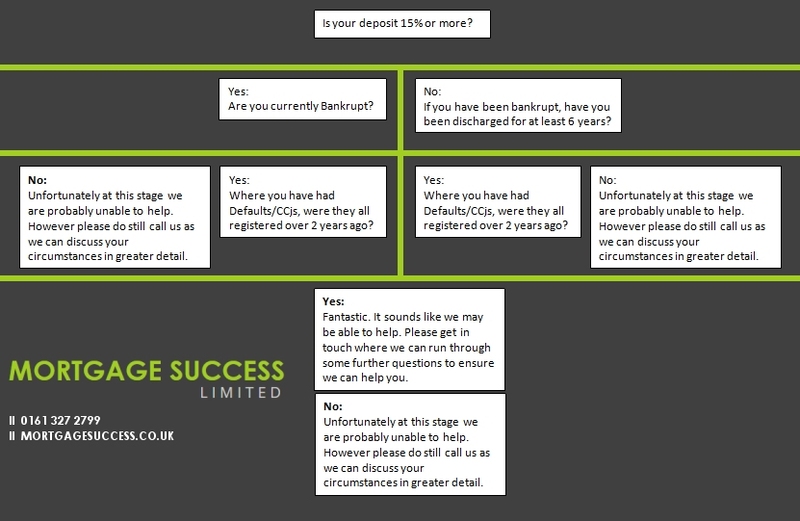 Below is a kind of flow diagram that shows part of our questioning process when discussing your poor credit issues. This only forms part of the questioning we go through. Everyone has different circumstances so our questioning will be a little fluid as it will depend on the answers to our initial questions but it hopefully allows you to understand a little better the process we go through. Poor credit Mortgages are what we do every day, they are our bread and butter type of Mortgages. As we are specialists for people with poor credit this means that by the end of the phone call we are usually in a position to give you an indication of whether or not we can place the mortgage and what the likely rates will be. Assuming you are happy with everything we have discussed at that stage, we would normally look to go through the factfind process and ask for copies of your credit reports. We then go and research the full Mortgage market where we have access to over 70 lenders. After our research of the mortgage market we would come back to you with our recommendations on the best Mortgage for your circumstances. We will have an open and informal conversation about your circumstances and go through some initial questions, have a little chat and go from there. There is no sales patter, no arm bending. We want our customers to work with us because they want to, not because they were talked into it. It can take a couple of months from start to finish so it is important we get on, trust each other and can work together as it can be a stressful time for you. *It is worth noting that as a whole of market broker we source from the entire UK mortgage market and our fees are only issued on our sourcing you a mortgage offer.